I think I have more than 13 readers, according to my Site Meter stats, so I'm going to try to bribe them into responding. Here's what I'm going to do. I'm going to hold a contest, you know - a give-away contest. And, if you're a parent, you'll REALLY want to pay attention. 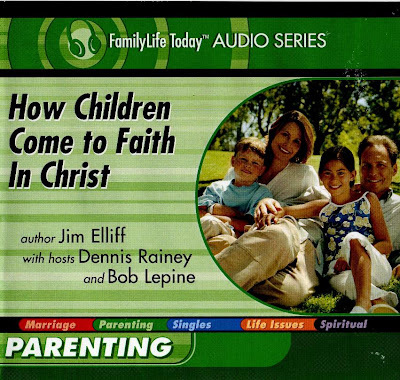 This week and a few days next week, Jim Elliff is the guest on FamilyLife Today, as they re-air an interview recorded quite a few years ago on the subject of childhood conversion. Let me tell you...I've heard a LOT of FLT programs and I firmly believe this to be one of the best they've done. This series has been on Bob Lepine's "Top Ten" list since it's original airing. 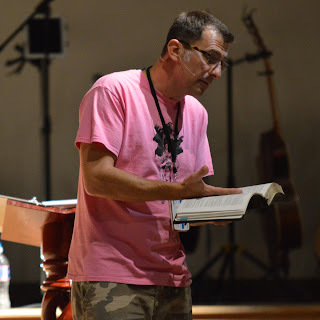 Jim shares in a most thorough way, the discerning process of evangelizing our children and then giving them a healthy, biblical assurance at the right time. He details how to communicate the clear gospel to our children - in their language - but without deleting any of the essential gospel components. If you don't know anything about Jim Elliff, go here - but come back, I'm going to give something away! Dennis: ...Jim – what does the word "conversion" mean? Let's just begin with the basics here. says. There is such a thing as the wrath of God, and the Bible says that God leaves a person in his own sin and then to an eventual hell who will not be converted, who will not be –another bible word – justified before God. Dennis: Within this word, then, is there repentance? the negative side against sin. The word "faith," or believing" in the Lord, would be the other. Often, these words in the Scripture are found together. Sometimes one word is used, and the other is assumed, but they represent a turning from and a turning to the Lord – turning from sin and a lifestyle that we've been living, and it is moral, repentance is moral, it's turning away from real sin in our lives and then turning to Christ by trusting our lives to Jesus Christ, the only one who paid the adequate price in our place for us. Dennis: And a child can do that? don't have any questions about that. But in the history of Christendom, it was always believed that children could be converted, but it was not always accepted that we could know if children are converted until a later age when their faith was tested so that they could see if what they had was genuine. You can listen to the current and past broadcasts here for free. So how do you enter the contest? Go to the post below or click here, and participate in the survey. The last question asks for the title and author of the current book you're reading. I'll take ALL book titles and choose one randomly from among them - I'll announce the winner by announcing the book title, and if it was your book title, just email me and let me know. If there happens to be two people reading the same book that gets selected, I'll send you both a set of CD's. Even if you're not a parent, please enter the contest...this would make an excellent baby shower gift or just a gift to give other parents that you know...OR, put the CD Album in your church library for everyone to listen to. I'm really excited about this product, so much that I've given quite a few of them away in the past. So, go down a post, click the survey link, and take less than a minute to complete the survey. I'll announce the winner Saturday night. what if you are reading more than one book right now? can you enter the same amount of times as the book/books you are reading? As I'm sure you're aware, I made two entries to your survey. The parody one, of course, you may exclude from your contest. Feel free to make a mockery of my satire though. I know'd it was you! Contest goes through this Saturday, March 10 at noon. Thanks for your comments! How do I add word verification? That is something I probably need. Have a wonderfully blessed weekend with your sweet family!